It's a wondrous thing to be able to take off to Europe for two weeks and share the history of the world with the girl you created 14 years prior. 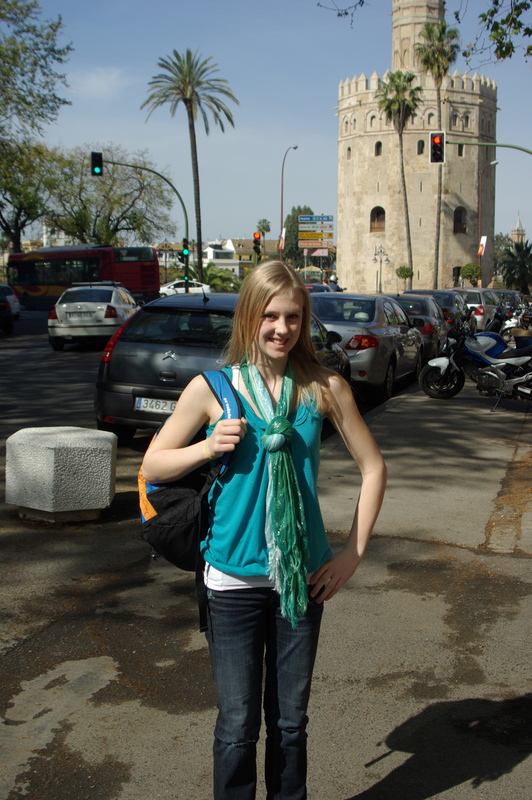 Our lives, hers and mine, haven't been the easiest these past five years and there was a time I could not dream of such a reality as a trip abroad with my child. It wasn't so long ago that I feared her childhood would be lost to me, held hostage to the grief I was mired in, sinking to the bottom of the sea of self-pity I once swam in. It's funny how life turns out, empty of one child's life, yet filled to the brim with three others'. There was a time this child of mine was all chin rolls and dimples. I'm having a hard time reconciling the two images. 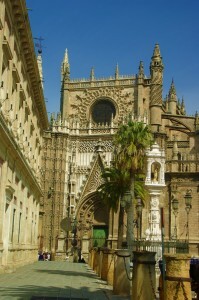 Seville was our first taste of summer weather. 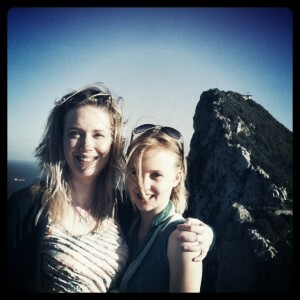 And for two girls whose neighbour may be Jolly Old St. Nick, we couldn't get enough of the blazing Spanish sunshine. The scent of orange blossoms tickled our noses and it was there I had no shame playing a tourist as we reveled in the warmth. Seville was also the place Fric and I had our first mother-daughter argument of the trip. After four days of spreading her wings, Fric longed for freedom. I tried to keep the leash I had her on long enough so she couldn't always see my shadow as she wandered about but it was in Seville that I reined the rope in. As a rural Canadian, I have the luxury of going days without seeing people if I choose. I can look out my windows and there is nothing but nature staring back at me. It's not often I am surrounded by so many people and I'll admit, it freaked me out. Seville was populated. Tourists. Residents. People! Everywhere! Starbucks! On every corner! It's like America! Only older! It's not like I have never been to a big city before but this was the very first time I had taken my daughter to a large city where neither of us spoke a lick of the national language. My instincts were to keep her close. Hers were to fly away and explore. Commence mother daughter head bunting 101. 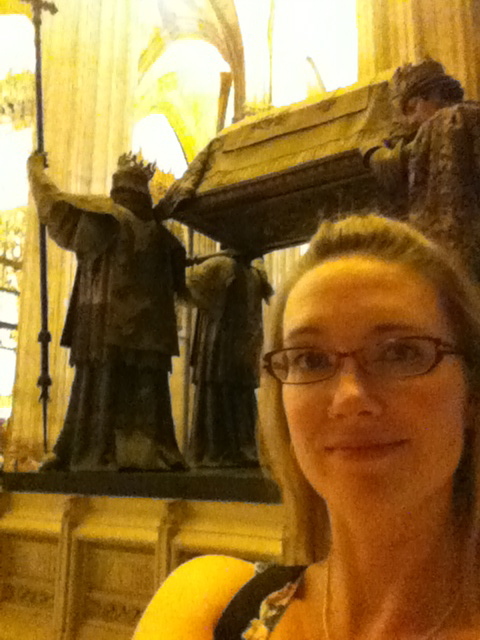 Standing in front of the Christopher Columbus tomb inside the Seville Cathedral. Lucky for both of us, a new marvel awaited around every corner and it's really hard to be an angry maternal tourist when your eyes are constantly popping out of your head and you are filled with awe. Lucky for that Spanish pervert who tried to tap my kid on the arse that he didn't seem to understand a lick of the angry torrent flowing from my over-protective mouth. While he may not have understood my actual words, the look for disapproving pissed off protective momma bear is universal and he quickly moved on before I could land my arse into a Spanish clink for killing a pervert resident. Thank you Spain for making me feel like an aging invisible hag. The ape liked my kid. My kid liked the ape. Our time in Seville was fleeting and it passed entirely too quickly. 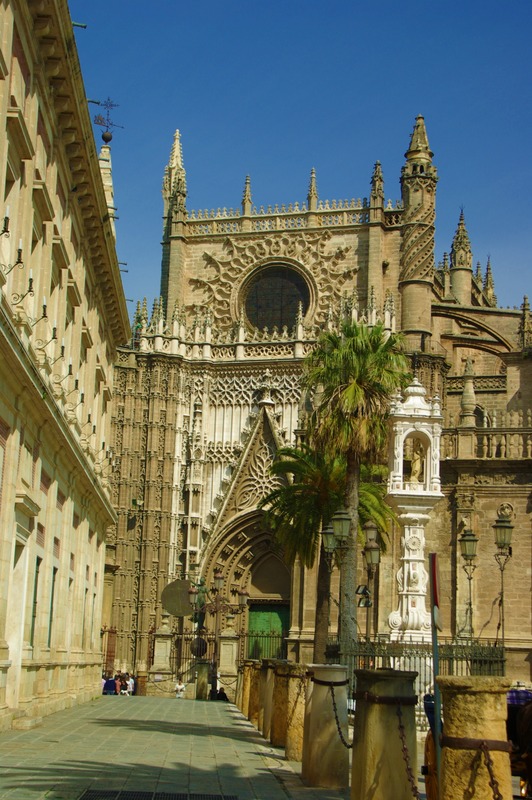 I've now added Seville to my list of places to return, hopefully with my husband in tow because I dream of walking down it's streets arm in arm with Boo, marveling at the beauty around us. 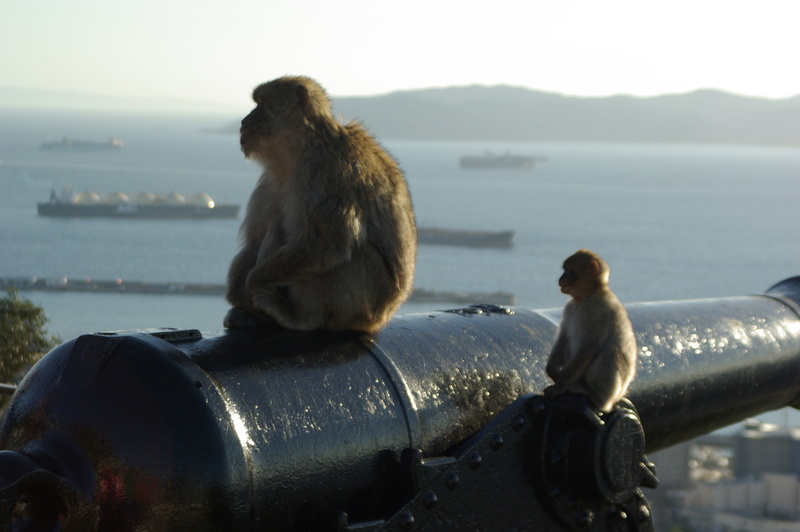 From Seville we traveled to Gibraltar, a British overseas territory at the tip of Spain. It was a close to Britain I got on this trip and the teens I was surrounded with were delighted when they saw the bobbies on the street. Um, wait, a second here. Sit PRETTY. Dammit. The Rock of Gibraltar will go down as one of the most interesting places I have ever been. It was the place I first saw the hazy shores of Africa far off in the distance. It was also the place where I was ferociously attacked by a pack of apes monkeys. Please don't pee on me. As our tour guide wove his way up the Rock, he regaled us with the legend of Gibraltar and historical tidbits. When we stepped out of our van, the little critters were everywhere. You know, because monkeys have a way of being monkeys. When he asked if any of us would like to pose with the animals, my daughter and my niece were the first to raise their hands. Happily the monkeys jumped on their heads and oh, the laughter ensued! Aw, how funny! A monkey is on your head! Since I'm never one to shy away from a possible blogging photo opportunity I thought, why the heck not? I nodded to our guide that I'd like the chance to get up close and personal with a monkey and then waited to meet the critter of my dreams. 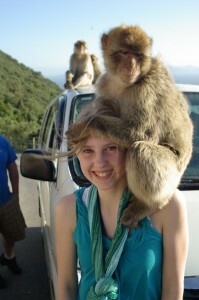 As I stood there, the guide suddenly starts warning everyone about how, under no circumstances, do we touch the monkeys. The monkeys are ferocious! They are vicious! They will tear your face off! 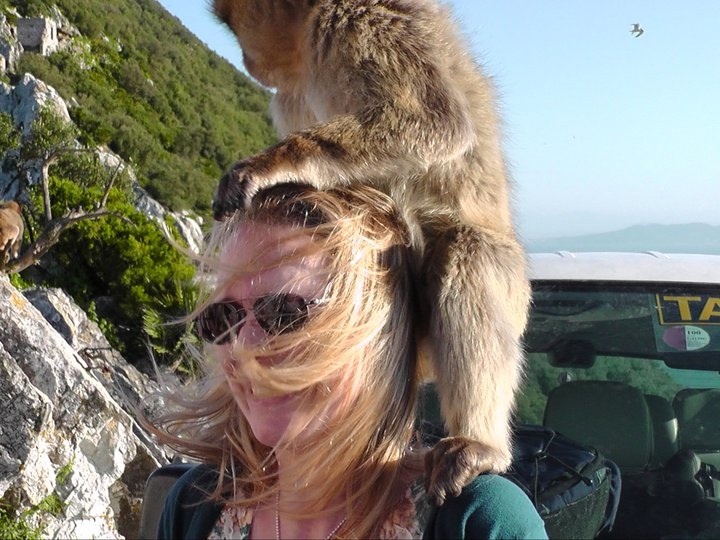 Just last week a monkey tried to rip the face off a female tourist! Suddenly what seemed like touristy fun now seemed fool hardy and stupid. "How exactly do we not touch the monkeys if they are sitting on our heads?" I asked. The tour guide looked at me like I was a stupid tourist (um, heck ya) and said, "It's different. The monkeys are touching YOU. Don't touch the monkeys." Just then a damn monkey jumped on my head. I may or may not have peed a little bit with fright. Visions of my face being peeled off as my daughter gleefully documented the attack with my iPhone ran through my head. 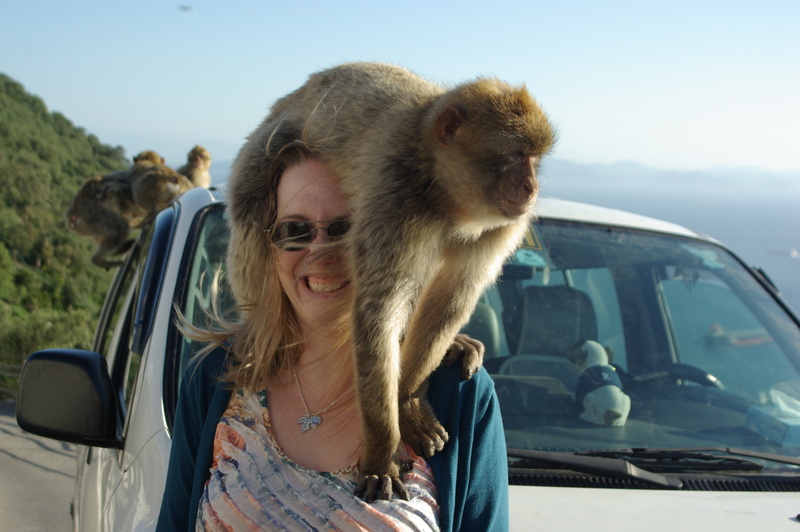 I survived the monkey attack. The dang thing wouldn't get off my head and more than once put his arse in my nose. Apparently he liked the smell of my shampoo. I wasn't so fond of the smell of his arse. I think he was eyeing me as a prospective future mate. I do have freakishly long monkey toes after all. Baby apes are awesome. Especially when sitting on weaponry. Monkey paws are very soft by the way. You know, when they aren't trying to rip the flesh off your body. Part of the reason I was so keen to take Fric to a far away place wasn't just to watch her discover a world that had previously remained hidden to her and only existed in history books. I wanted my daughter to see me, for a small second, as more than just her mom. I wanted her to see me. Tanis. I never, however, wanted her to see me as monkey bait. At the top(ish) of the Rock of Gibraltar. Or as I call it, Planet of the Apes.